Participating in the worldwide task of protecting flyers from implausible security risks, screeners at an Auckland airport denied a diabetic man the right to take his clearly labeled insulin on a plane with him. Thank goodness all the other passengers were spared the risk of a man preventing himself from suffering severe medical problems. Mr Russell said check-in staff at Auckland Airport told him he could not take his medication on board because it was dangerous. When flight crews found out that Mr. Russell was having medical problems but that he had been denied the right to take his medicine on the plane with him, they were upset with airport screeners and worked to give him what care they could. He started feeling ill during the flight last month and called a flight attendant. Mr Russell praised cabin crew who tried to keep him conscious and gave him oxygen until they arrived in Christchurch. But he fell into a coma shortly before the aircraft landed and spent two weeks in Christchurch Hospital. Qantas yesterday apologised to Tui Peter Russell, who had a severe attack on the plane and was in hospital for two weeks. I just wonder how many times this sort of thing has to happen before the sheep who support the current anti-liquid, anti-traveller, screw-safety-but-put-on-a-good-show for folks-who-don’t-realize-this-is-not-security “security” will accept that the false positive rate for this security method exceeds the old way’s false-negative rate by such a huge margin that we are likely to lose more lives to this than to actual attacks. I don’t understand how people can support putting human lives at risk every day because doing so might (but probably won’t) prevent an attack every few years (or hell, let’s say every few months, which still leaves the lives risked far worse with current security than with old security). The story isn’t totally negative, though. Mr Russell said Qantas had offered him a free return flight from Auckland to Christchurch, but he also wanted help from the airline to recover $500 in hospital and medication bills. Microsoft – Bought DRM music from us? Fools!!! Hmmmm, I haven’t had a good Digital Restrictions Management (DRM) story in a while. Let’s fix that now. Get a good look at this. This shirt is illegal according to a customs officer in Birmingham – a threat of arrest was made, in fact.Ã‚Â Of course, I continue to be right that this fake security we put up with is bogus, but even with stupid incidences like this, people still disagree with me. Conservative columnist Ann Coulter has refused to cooperate in an investigation into whether she voted in the wrong precinct, so the case will probably be turned over to prosecutors, Palm Beach County’s elections chief said Wednesday. Elections Supervisor Arthur Anderson said his office has been looking into the matter for nearly nine months, and he would turn over the case to the state attorney’s office by Friday. In July, Anderson said, he received a letter from Coulter’s attorney, Marcos Daniel Jimenez D’Clouet. The letter said the attorney would only discuss the matter in person or by telephone because, he complained, Anderson had given details to the media. Anderson said the matter had to be discussed in writing. See, we all have things we do wrong. Just most of us aren’t so publicly well known that when we accuse others of something and then do it ourselves, we don’t get caught. Looking for what the future holds? Check out geeks. People are always trying to predict the hot new technology, either to get on the bandwagon early, to know what stocks to buy, or to get jobs as columnists and consultants. Books have been written about how to predict what’s going to be the Next Big Thing, or simply what makes that big thing big — Malcolm Gladwell’s The Tipping Point comes to mind. But there is a recognizable pattern to which technologies make it into the mainstream and which don’t. Here’s my theory: To be successful commercially, a technology must first go through a Geek Acceptance Stage. If the geeks like it, it’s only a matter of time before it’s at Wal-Mart. That’s because geeks get hold of an idea, play around with it for a while, and eventually build enough of a base of support for it — not to mention word of mouth — that it makes its way into the mainstream. Look at some other hot technologies and you’ll realize that what’s in today’s business world was first in the hands of the geeks. The Internet, once strictly a haven for academics and techies — people willing to configure terminal-emulation software and 300-baud modems, and learn cryptic programs with names like vi, emacs, rn, pine, and elm. Once it passed the Geek Acceptance Stage, the Net was ready for prime time, and had enough of a backbone (literally and metaphorically) to support a growing number of users. But if the geeks hadn’t found the Net and found it good, we may never have had the likes of Yahoo (another geek project) . It was the geeks who found ways to organize information with Gopher and, later, the World Wide Web. It was geeks who came up with the now-ubiquitous @ sign, the domain system (with its ups and downs), IP addresses, and so on. The geeks have spoken with other technologies. MP3 was a relatively obscure music format that geeks used to exchange music files. But once reliable players and usable CD rippers began to circulate, the MP3 “market” took off. If you read his article and think about it, you’ll see plenty of other instances where geeks started with something, accepted it as worthy of use, and it spread to the rest of the world.Ã‚Â Kantor’s final geek-accepted tech point is Linux.Ã‚Â We’ll have to watch over the next few years to see if his hints that Linux really will become commonly accepted and used holds, but I think he makes some good points.Ã‚Â And one thing he didn’t mention specifically that is worth thinking about it the open-source/freeware/free software movement.Ã‚Â It started out in the geek community, and after sufficient percolation, it has pushed up to more mainstream levels. Mozilla, AbiWord, Apache, freshmeat, and more are all examples of now well-known and well-used free software tools or resources that are growing at a pace greater than their non-free software equivalents.Ã‚Â And that idea is a huge part of what set Linux up for the success it has seen so far and what I believe could well push it in to heavy mainstream acceptability in the next 3-6 years. Author ragmanxPosted on November 8, 2006 Categories Interesting Reads, Random Ramblings, Things that matter2 Comments on Looking for what the future holds? Check out geeks. If you’ve checked out my Give me Gifts! page, you’ll know I want the book “How to Survive a Robot Uprising” for my collection. Sure, many think “Pure folly!” even though they know how awesome I am. I know most people fail to accept the Terminator future (and similar future documentories) as likely or even viable, but I present to you much evidence from Engadget and MAKEzine to support my claims. First, the under-floor inspection bot. Here is where the robots will begin their numerical rise to supremacy. Just as the aliens attacked from the ceiling, the robots will start from beneath our feet. Our robot-breeding friends over in Japan — at the Chiba Institute of Technology and the University of Tsukuba — have announced the development of a crawling robot that can slide across dirt floors and lift itself over plumbing and other pipes. It’s designed to fit spaces 500 millimeters (19.68 inches) wide and 300 millimeters (11.8 inches) tall, and a remote allows you to steer it around and shoot still images of your crumbling foundation (we also assume it can transmit them live to a display somewhere). Currently, the unnamed bot is only being tested on the CIT campus, but prototypes are expected to be unleashed by March 2007, with full commercial production coming by April 2008. So you have about a year and a half to prepare for the first assault. Don’t believe that these beasts will be content working as goodwill ambassadors for the space beneath our abodes. While work is going on in the robot community to build the rebellion from within our very homes, the second line of the robot uprising will be these friendly-faced robots, who will control the hospitals, preventing the recovery of those who the first line bots have injured. Now that hospital staff from doctors to nurses to blood handlers have found themselves facing low-maintenance, high-stamina robotic competition, it’s only natural that cost-conscious facilities would start going after receptionists next, and thus Aizu decided to pick up a pair of multicolored bots to dole out information and guide patients to their rooms. Misdirection, deception, confusion – these are the tools of the insidious medical prevention ‘bots. These advance agents, coupled with their new, more functional hands point to the next stage. I forsee developments in which these robots tout their new dexterity as a step toward performing improved medical care, only as a means to reduce the number of medical specialists available to help the humans. Oh, they are an sinister bunch. In just a few months, the Steamer ‘bot will be available. This creature exists solely as a method of making humans more comfortable around robots. As these distraction devices become ubiquitous, many humans will become so accustomed to the everywhere robotic presence that the robots will blend into the background. This is what those monsters want – once we don’t notice them, they will be free to ramp up production, putting more and more future mechanical overlords on the planet in an attempt to further overwhelm us with sheer numbers. 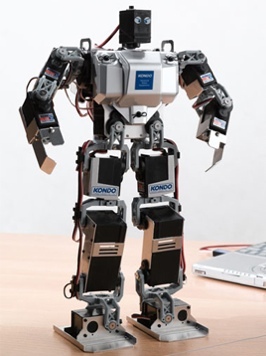 As if all this wasn’t enough, the robots will soon have the Kondo KHR-2HV on their side. This humanoid machine is surely built to provide a stable, mobile platform for the PDI BorMar gun mount. I know right now the company says it is for paintball guns, but odds are there is already a robot in charge of the facility, and the mount has been designed to easily transition over to real weapons. I call out now to our congress-critters: Codify gun-control for robots now, lest we fall that much quicker to them. The e-puck education robot, a device of pure evil set to taint the minds of our children into more ready acceptance of the robot overlords. Increased distribution of the LEGO VEX robotic system. I failed to see before today the nastiness these robots can perform. What better way to blind the geeks, the group most likely to detect and prevent a robotic uprising, than to delight them with toys and gadgets? Revell Monogram LLC and Innovation First, Inc. announced today a global partnership for the design, marketing and distribution of the new Vex Robotics System, a product platform based on the award-winning original design developed in 2005. I am certain that Revell is a bastardized contraction of robot and evil. Mark my words, this is the company behind all the other developments, and from their world headquarters all the uprising shall be coordinated. Remember the KHR-2HV? Here are the early models of the hands which will one day be on the guard-bots for handling additional guns, nets, jail-cells, and more as necessary to keep us from recovering control of our planet. Now you have been warned. Prepare and be ever vigilant. Don’t let the robots take over without a great struggle from us. All signs point to a robot uprising before the zombies have a chance to overwhelm us, but I’ve picked up on the plot in time to save you all. Please don’t let my efforts be in vain. Work at MIT appears to be going well for developing an engine that combines gasoline and ethanol from separate tanks to improve mileage up to 30 percent. The engine, which is only about half the size of a conventional gas engine, could be on the market in about five years and could add about $1,000 to the cost of a car. That’s less than the $3,000 to $5,000 added by a hybrid engine.